We were so excited to see Mad Men return this past weekend for its sixth season. We’re even more excited to see the vintage mid-century modern décor inspirations that await us. This season, Mad Men‘s characters are moving into the 1968 New Year. Sideburns are growing longer, bouffants are rising higher, and plaids are getting longer. After an eye-popping Hawaiian vacation sequence that reminded me of the cursed tiki idol episode of The Brady Bunch, it was nice to get back to the mainland and see that Roger Sterling’s sleek, black-and-white office is one thing that hasn’t changed with the swirling colors and turbulent times. We first saw Roger’s current office in Season Four, when we learned that his new wife, Jane, had decorated it. Now, in Season Six Roger is on his own, but we do get to see Jane appear in a black and white mourning ensemble that is almost as chic as the minimalist office she once decorated for her former husband. 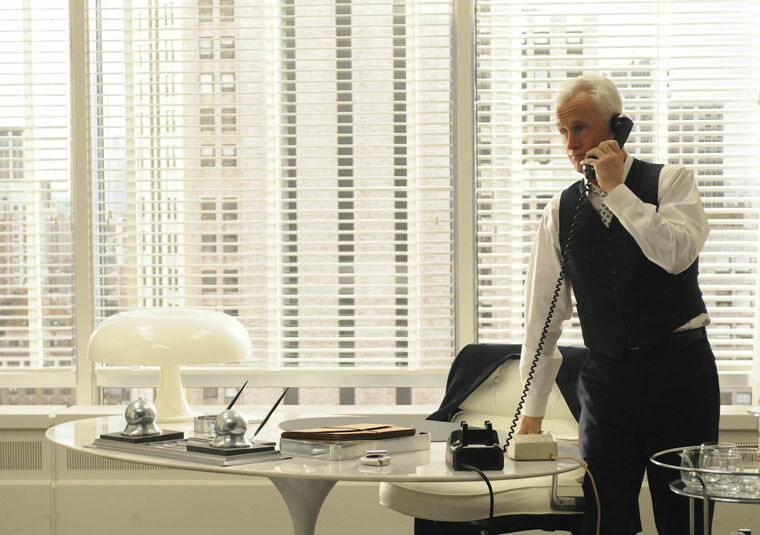 Bar Cart: Bosses in the 1970s may keep their Scotch in an office drawer like Lou Grant, but Roger Sterling has a bar cart —indisputably the more stylish option and something we can all aspire to. If you want to see vintage options, go to Etsy, search “bar cart” and find options ranging from $150 to $2,000. There are also some sleek, inexpensive contemporary options with similar shine, such as this Ernest Chrome Bar Cart from cb2 ($179). If you find an old tulip table that seems rusty and tired, consider a coat of spray paint to freshen it up. Upcyclers give high marks to Valspar Color Radiance — and if you want to stray from black and white, we love Valspar’s spray paint colors for other MCM palettes. 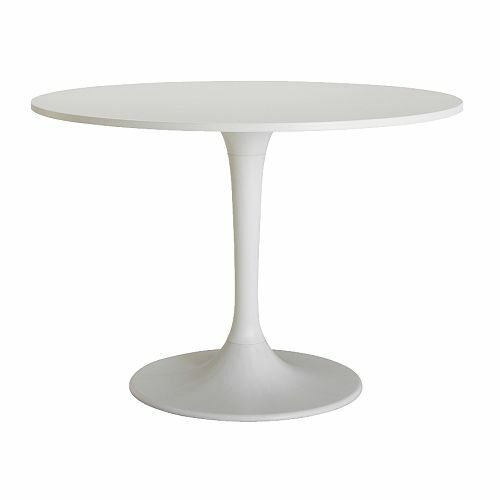 You can also find reproductions such as the DOCKSTA table from Ikea ($199). Roger can use the tulip table as a desk because he doesn’t do much actual work. In our day, the paperless office and wireless equipment makes the tulip table more practical than ever as a work surface. Need a small place to keep desk-related odds and ends? 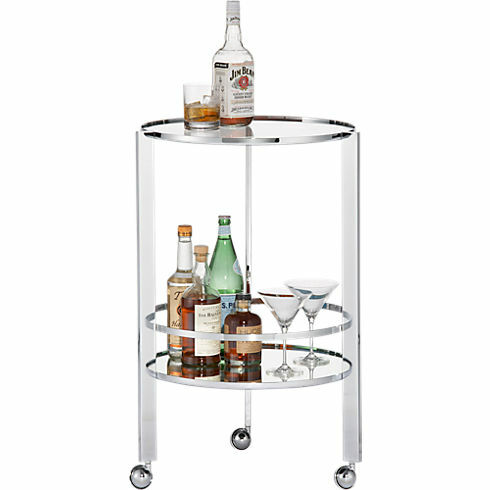 Consider a bar cart. Abstract Black & White Art: One of the most striking features on Roger’s office is the giant modern paintings on the walls. Get the look by searching for mid-century modern paintings in flea markets or contemporary originals. Get the Abstract Black & White Look for Less: Go to a craft store and buy a large canvas (it doesn’t have to be a high quality canvas). Then, go to a craft store and find a black and white abstract print that appeals to you. You can find such patterns in the quilting section or you can browse designer, print-on-demand options on Spoonflower. Just click the ‘black and white’ tag to find hundreds of groovy fabric options. Buy the size to fit the canvas. Stretch it tightly around the canvas and secure tightly to the back side with a staple gun. Another option is three or four adjacent canvases hung together. Do you have a favorite room from Mad Men, one that inspires your flea market hunts for mid-century modern décor? Tell us, and let’s dish on how to get the look. This entry was posted in Decor Inspiration and tagged abstract art, bar cart, black and white, graphic, MCM, mid-century modern, minimalist, spray paint, tulip table by Flea Market Decor. Bookmark the permalink.